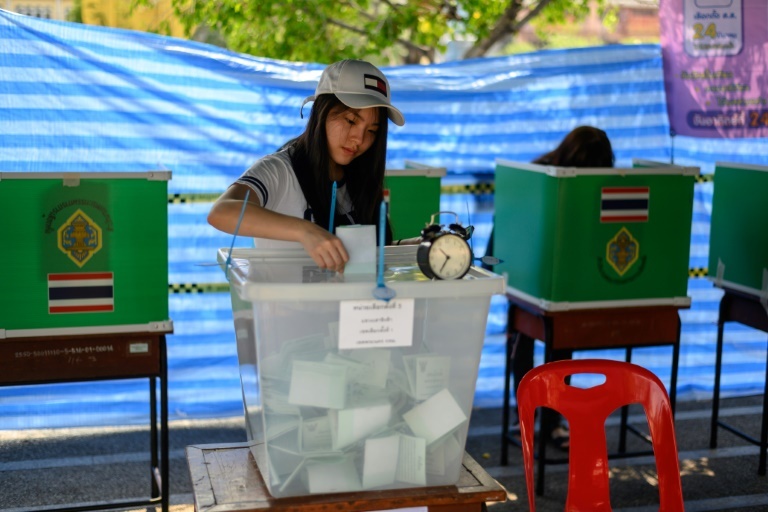 Thais began the nail-biting wait late Sunday to see whether the ruling junta will return to power as a civilian government, or if pro-democracy parties can triumph against the odds, as polls closed in the country’s first general election since a 2014 coup. The Election Commission estimated turnout at 80 percent as voters flocked to schoolyards, temples and government offices across the nation, their enthusiasm fired by years of denied democracy. The election pits a royalist junta and its allies against the election-winning machine of billionaire ex-premier Thaksin Shinawatra, who was toppled in a 2006 coup, and an unpredictable wave of millions of first-time voters. “I am anxious,” said Wipa Ployngam, 53, outside the Bangkok headquarters of the upstart, anti-junta Future Forward party, hoping a pro-democracy coalition will nudge its way to victory. Experts say unstable coalitions could swiftly collapse, dunking the kingdom back into political crisis. Preliminary results were expected within a few hours of the polls closing at 5:00 pm (1000 GMT) with exit polls giving an unreliable steer on the outcome. Fears of the potential for foul play amped up as polls closed, in a reflection of the lingering mistrust between rival political camps. Pheu Thai was well ahead in the early count in its north and northeastern heartlands. She also urged the 250-member junta-appointed senate to “act in line with the will of the people”, a reference to system which allows the upper house to appoint a premier from a minority government. But with senate votes in hand, the junta-party Phalang Pracharat needs just 126 lower house seats to secure a parliamentary majority, even if it does not carry the popular mandate. Pheu Thai needs 376 lower house seats to command an overall majority. Many younger voters are expected to surge behind the telegenic 40-year-old billionaire Thanathorn Juangroongruangkit and his Future Forward party. In early counting, Thanathorn’s social media pull appeared to have carried into the polling as his party galloped ahead in several Bangkok seats.